Mario Venzago describes this cycle as "a different Bruckner", but it's not as different as he seems to think. Some ideas from the period instrument movement are brought into play, but these only serve to highlight the conventionality of the "modern" performance conventions with which they rub shoulders. It's a fascinating combination though, and the results are deeply satisfying, even in these earlier works. So what's new and what's old? Well, Venzago limits the vibrato from the strings. He also uses a small string section. As a result, the strings are able to play with exceptional clarity and intimacy. They are also able to balance the brass in the climaxes, and perhaps their metal strings are to thank for that. Venzago sees rubato as a virtue and his tempos, while often brisk, are always fluid. This allows him to build up to the climaxes, despite his reduced forces and lack of string vibrato. 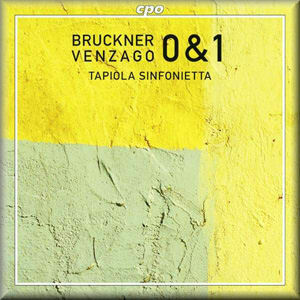 Another interesting feature of Venzago's approach is his conviction that much more of Bruckner's orchestral music is chorale-based than we think. As a result, he always tries to make the quieter woodwind ensemble passages sound like male voice choirs, with round, euphonious timbres and clearly articulated phrasing based on the players' breathing. Again, this isn't really a radical departure, but it allows Venzago a slightly different focus for his interpretations. Both of these works are usually considered in need of serious help from the podium. In most recordings, the conductor will try to justify programming Nos. 0 or 1 by doing everything in his or her power to make the work in question sound like one of Bruckner's last three. Venzago rightly sees that approach as anachronistic. He also strives to present each of the symphonies as an individual work, and so never stresses any interrelations between them. He demonstrates conclusively that neither piece needs apology or excessive intervention. Schubert is his model in these earlier symphonies, and the clarity of the textures that Venzago draws from his reduced orchestra certainly highlights the continuity between the symphonic languages of the two composers. Personally, I'm convinced that the Zero Symphony is superior to the First, but in Venzago's hands it is the First that really shines. The precision of the textures, the subtle gradation of articulations and the fluidity of the tempos all come together to make this a dramatic and thoroughly convincing reading. The ending of the first movement, for example, is as powerful and incisive as any on record. The second movement initially seems constrained, but by loosening his grip in some of the louder tuttis, Venzago is able effectively to counter any suspicions of Classical formality. The third movement is given propulsion and gravitas, not by dynamic extremes, but by the range and weight of the accents from the woodwind and brass. The finale attains a truly symphonic scope through the interplay of powerful orchestral tuttis and chamber-like interludes. The Zero Symphony, great as it is, doesn't quite have the same dramatic or rhetorical potential for Venzago to reinvent as he'd like. It's still a great performance, and earns its place in the catalogue through the insights that the smaller orchestra and Schubertian performance practice bring. It is interesting that these two symphonies have appeared so early in the cycle. This is only the second instalment, after a first which coupled Symphonies 4 and 7. The programming on the first release was clearly based on commercial concerns, but putting these earlier works on the second seems more like a statement of intent. I suspect that these will be the most distinctive readings of the whole cycle, but they augur well for some individual and accomplished versions of the more famous symphonies later on.